Pioneers in the industry, we offer float ball from India. With our several years of successfully providing our clients superior quality products, we have gained proficiency in offering an extensive array of Float Ball. 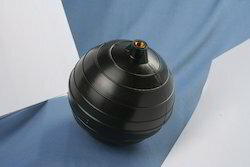 The offered ball is used in flush tanks and auto water cut off valve. Highly praised for its various features, this ball is highly demanded in the market. The offered ball is manufactured by our skilled professionals using superior quality raw materials and modern technology. Looking for Float Ball ?